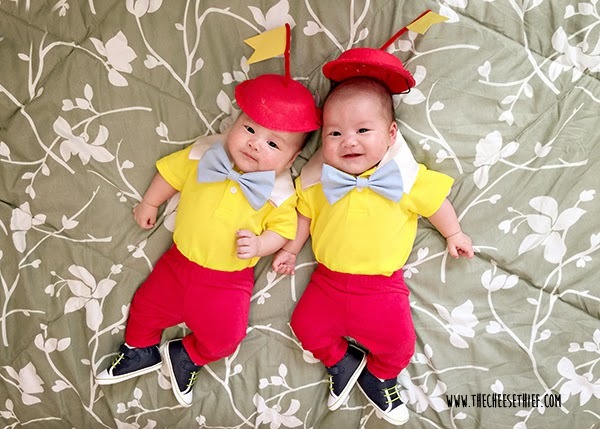 I finally finished the twin's Halloween costume. It was more work than I thought, maybe because I had to make two of everything. The effort was well worth it after I got to see them in the costume. It was so cute on them. 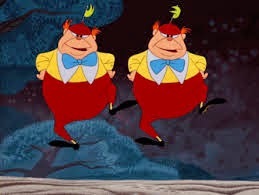 Started off with two yellow polo onesies and two pairs of red tights purchased at Kohls. They were having a sale so both the yellow onesies and the red pants were 15 dollars (for all four!). To make the white collar I cut an old shirt I had into a rectangle and glued the seams. This is not the correct way to make a collar, but it was way too much work to a proper collar. This worked out decently seeing as how they will wear this collar only once. I fold the collar over and attach to onesie. The collar measured about 14 inches across and was 3 inches wide. You can glue or sew the collar onto the existing polo. I slip stitched the collar onto the shirts because I still wanted to use the shirts later. The hat was probably the part of the costume I pondered most about. I didn't know what to make the hat out of and I didn't want to buy any hats as the boys do not like things on their heads. At first I was going to make a paper mache hat, but that can be messy and a lot of work. Then one night my daughter took a paper bowl and put it on her head. I had a eureka moment. Paper bowls painted red for the hat. Paint the inside too because you will be able to see the underside. Flag for top of hats are made of pipe cleaners and construction paper. The yellow construction paper is reinforced with cardboard. I did tie a black elastic (like for birthday hats) onto the bowls, but they were not happy when I put the elastic under their chins. If you had two red beanies that would be a good option. For the bows, I had and old blue pillowcase that I used for the bow ties. 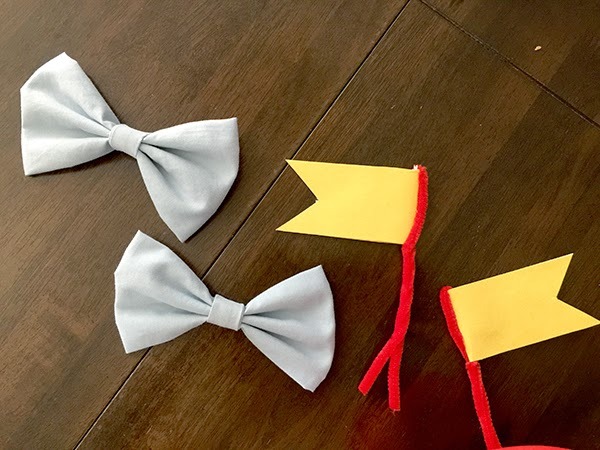 Here is a video tutorial on how to make a bow tie in less than ten minutes. In the tutorial I made a small bow tie. If you want to make a large bow tie like the one in this costume, use fabric that is 15 inches by 8 inches. That will yield you a bow tie that is approximately 7 inches by 3 inches. 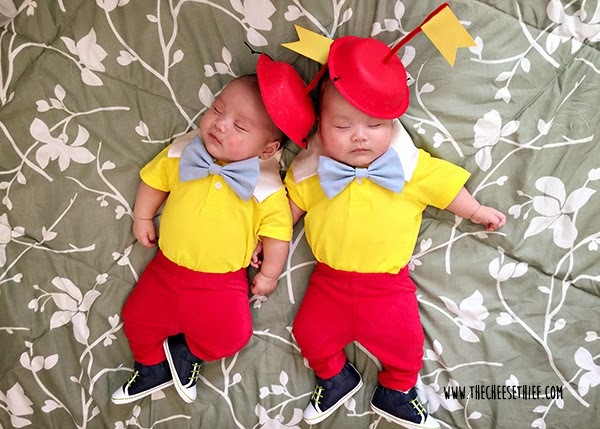 Here are my tweedles just dreaming of white rabbits and tea parties. I just amazed to see your ideas and thoughts, thanks for share that. Nice post. I learn something new and challenging on blogs I stumbleupon everyday. It will always be interesting to read articles from other authors and use something from other websites. Look so cute! That good idea. I like your post. Thanks for sharing! Very Cute.. Baby.. Love it. Our Custom heat sensitive mug is the use of imported coating, and ceramic grade selection are a porcelain, in full compliance with national standards. cute baby. i like it !! There is a chance you are eligible to get a $100 Kohl's Gift Card. The Information Paradox should be compulsory reading for government (and business) herbal Walatra managers and consultants who are concerned with planning new programs intended to realize expected benefits or with evaluating existing programs to determine if benefits are being realized. Part One of Twin Costumes Complete. Any Guesses?